Competitive Edge Products, Inc. is committed to bringing you the best products at the lowest prices. If you find this model of Activity Table cheaper anywhere else online, let us know. We will always try to match or beat their advertised prices. The AR3060 features a 30 in. x 60 in. plastic table top. 60 inch table tops are typically suitable for coloring activities and most games for up to 6 children. The plastic used for these tables is stain resistant, even against most foods, paints, and crayons. Cleaning plastic table tops is easy. Usually, only soap, water, and a rag are necessary. For tougher stains, a mild abrasive may be required. Plastic table tops make the table lighter and easier to move around. The frame of the table is steel, which makes these tables very sturdy. Handling the active use of preschool and elementary age students is what these activity play tables are made for. Order your Kids Activity Table today. 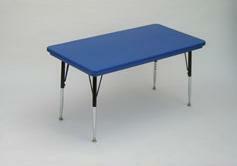 Competitive Edge Products, Inc. is an authorized retailer of Correll AR3060 Kids Activity Tables. AR2448 Kids Activity Table - This table is the next smaller unit compared to the AR3060. Kidney-Bean Shaped Activity Table - This model of activity play table is shaped and designed to create maximum interaction between student and teacher. Q: Are the legs adjustable? A: The height is fixed-not adjustable. Shipping on In Stock Items: Orders for the Correll AR3060 generally leave the warehouse within 1-2 business days. 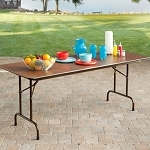 Dimensions: 62" x 32" x 3"
Correll Activity Tables A2436 High-Pressure Laminate Top 24 x 36 in.